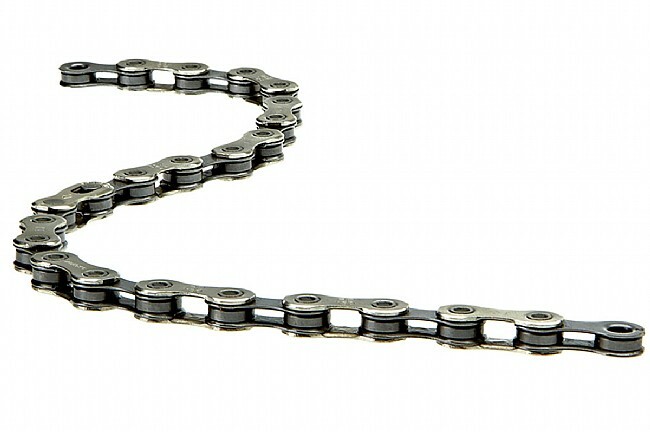 The PC-1130 11-Speed Chain is a Rival level component that balances performance and affordability. It features chrome-hardened pins and nickel-silver outer plates for longevity that stands up to the grime and grit of the road. Includes a PowerLock® connector link. Claimed weight is 259 g (114 links). Good quality chain at a reasonable price. Good around chain. I use it on my Tri bike and it's never failed me in training or races. SRAM chains work well. The enclosed master link makes installing the chain much simpler (not that the old method is that difficult provided one has the proper tool) because no tool is necessary. The price was right on biketiresdirect.com. I purchased this so I could transition to a long cage derailleur. It's the right component for the job. Works well and is quiet. Great price for a great chain. Doesnt seem to get dirty easily. Works with powerlinks. What else is there to say? Its a chain! If you run a SRAM 1x drivetrain for cyclocross racing or gravel riding in general, this is a great option. Not too expensive, just a small weight penalty over the 1170 chain, but runs just as smooth. It's going to need to be replaced after each season anyways, so why not save a few bucks. This chain is a great balance of price and performance, and the PowerLink makes it really easy to install or take off and clean thoroughly after a muddy race. After breaking several Shimano chains it was time to try another brand. I started using Sram chains and my problems went away. The weakest part of any Shimano chain is the pin connecting the ends together. With Sram's Master Link the weak link is gone and the connection is really solid. The Master Link's can be purchased separately for very little money so you can keep one in your under seat bag and in the very rare case you do break a chain on the road you can still get back home. Its such a good idea it is almost amazing that any company is still using pins to hold the chain ends together. Tough as nails. Well, probably tougher. I purchased this chain as a spare to sit on the shelf for the original on my CX bike. That chain has almost 3000 miles of Nebraska gravel, CX, and MTB singletrack and is in great shape with little wear so far. Like I said, tougher than nails. Paired with the SRAM X-Sync it makes a near bombproof system. Of course, I keep it cleaned and lubed well, but, man, it's a tough chain. Going on 2000 miles with this chain. So far so good. Still shifting smooth and crisp. Will buy again.